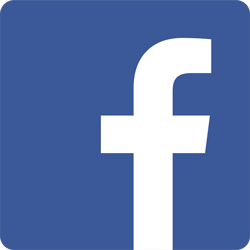 Many people who want a safe at home will buy a used business-type safe from an auction or directly from a business that is closing. They assume that a used commercial safe will provide appropriate security and fire protection at a cheap price. Most business safes, however, are not suitable for home owners. The majority of gas stations, convenience stores, restaurants, bars, etc. have safes. But their safes are typically steel B-rate units with no fire protection. Businesses generally want to deter theft but do not want to pay the extra cost to get fire protection. Many businesses have detailed daily accounting systems, so even if they do experience a loss due to fire, their business insurance will cover cash that was burned up. Homeowner’s insurance is different, it normally does not cover a loss of cash. Businesses often have deposit-type safes with which employees can drop money into the safe without opening the main door. But any form of external deposit doors, drawers or slots will allow hot air to infiltrate the safe. 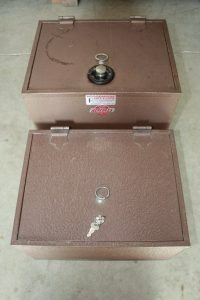 A home owner using this type of safe is likely to lose everything that was locked inside. Some B-rate safes do not offer as much burglary deterrence as a home owner should have. While the door is usually ½” thick steel, the bodies are thinner – much thinner. In a retail setting the safe is normally anchored securely to the floor so it cannot be moved, and it is located in a place where there is no access to the thin steel body. Access to the sides of a safe is very common in homes, so a commercial B-rate safe is not ideal. Beside that, stores have additional security in the form of alarms, cameras, etc., which most homes do not. Consumers frequently assume that all safes protect against fire and burglary. They do not appreciate the differences in mindset of a home owner vs. business owner. Even when a business experiences a loss, it is most often just one day’s revenue; the home owner might lose a significant percentage of his life savings. Other issues like weight work against using a business safe at home. For instance, we were called two weeks ago to a recently closed jewelry store. Knowing that the jeweler’s large vault had both fire and high security ratings, a man planned to buy it for his home. He hired two men with an appliance dolly to move the safe to his house. Well, the safe weighed 4200#, so his plan did not work. If he had been successful in getting home, there was no way that his main floor or stairs would have supported the vault, anyway. If you plan to buy a used business safe for your home, do enough research to make sure it is an appropriate unit. The last post talked about hobnail safes which were made in the early 1800’s. Wooden bodies covered with steel strips made them somewhat fire resistant. In an effort to improve fire protection manufacturers switched over time to using other materials for insulation. John Scott, whose hobnail safe was featured in the last post, seems to have been the first manufacturer to switch to asbestos, around 1840 or so. His patent for using asbestos was issued in 1834. The history of people using asbestos goes way back. As early as 4000 BC asbestos fibers were used as wicks in candles and lamps. Egyptians wrapped mummies in asbestos blankets around 2000 to 3000 BC. It has been found in pottery from 2500 BC. When burning tar was lobbed over fortress walls with catapults, it was held together with a bag made of asbestos. But its use really took off during the industrial revolution. Surprisingly, some of its harmful effects were known way back by the ancient Greeks and Romans because slaves working in the mines suffered from lung problems. Personally, my first experience with asbestos was when I stole an asbestos rock from my high school science room because it was fun to peel off strands of the silky fiber. And when the exhaust pipe on my old car rusted apart, it was patched with a sheet of thick asbestos felt, wrapped with a soup can, held together by coat hanger wire. I must have breathed in some of it while laying on my back, looking straight up at my repair work. Anyway, this is supposed to be about safes . . .
Pictured is one of my favorite antique safes. The insulation is asbestos mixed with plaster of Paris, applied over the wood interior wall, then wrapped by steel plate. This model does not make a very good end table because of the round top. But it is a unique conversation piece. I am not concerned about asbestos because the safe does not give off dust. It is hard to tell which old safes contain asbestos, in part because it was used in different forms. Some makers mixed it with plaster of Paris or concrete. Some used soft board-like sheets, and some used thick, light-weight fiber “blankets”. Safes with the soft boards or blankets usually give off dust, so I won’t deal with them. Some manufacturers had fancy names for their asbestos insulation; the Macey Company from Grand Rapids, Michigan called it “H-E-L-F-I-T-E” to emphasize its fire resistance. Thankfully, the safe industry kept evolving and eventually settled on different kinds of insulation. The 1832 newspaper ad shown here talks about the excellent performance of a “hobnail safe” when it went through a fire in New Orleans in 1831. 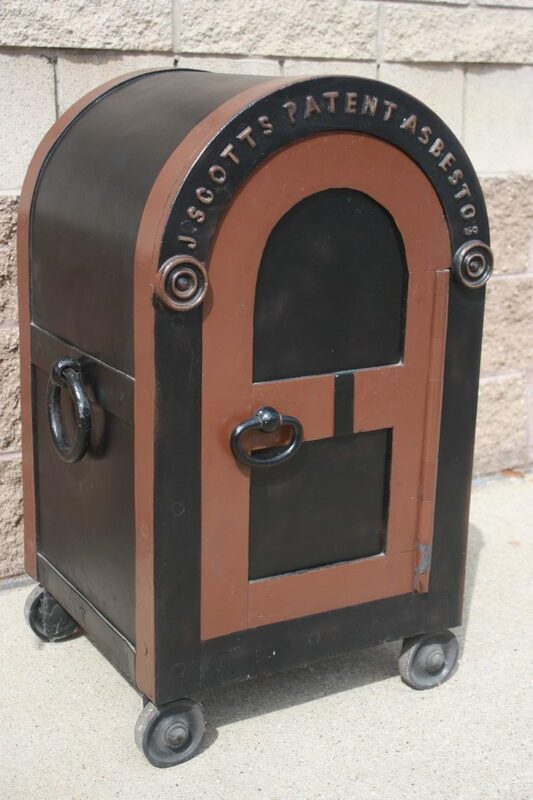 The safe in question was built by John Scott of Philadelphia, who was one of the leading safe makers at the time. One of the hobnail safes in our store was apparently built by John Scott. It looks just like the unit shown in the ad, inside and out. This ad was, in fact, inside our safe when we bought it. Hobnail safes have wooden bodies. The wood was soaked in salt water prior to making the safe, so that it would be more fire resistant. To give them more burglary deterrence strips of steel were interwoven and secured to the wood using large spikes with big round heads. The big round heads all over the exterior are why they are called hobnail safes. A fun thing about these units is that one, or several, of these spikes move sideways to cover up the keyhole. Keys are typically huge “skeleton” type keys. The other John Scott hobnails in our collection do not have stained and varnished wood interiors; rather, they are both pained in a strange “rusty-orange” paint. Jesse Delano was the other major maker of hobnails in the U.S. It does not seem to make sense that wood could be used to for insulation in a fire safe. But apparently if the wood is covered from direct contact with fire, its porousness makes decent insulation. Hobnail safes in good condition are unusual and, therefore, not cheap. We have a few for sale, however, so call if you are interested in a nice antique safe. We see lots of the older, top opening fire safes like the ones pictured here. They usually carry the “Safe-T-Vault” name by Meilink or Hercules. They have a one-hour fire rating, and the ones I have seen that went through fires have performed very well. I believe these little fire safes were built in the 1950’s, 60’s and 70’s. I happen to like them but it seems like no one builds them anymore. That is probably because too many people were not careful enough and had their fingers crunched when the lid came down accidentally. There is a chain to keep the door from slamming down behind the unit, but no good way to keep the lid from falling forward. So the manufacturers probably got sued over a broken finger here and there. Anyway, the safes have handles on each end for carrying them. As the picture shows, some came with key locks while some came with dial locks. Safe-T-Vaults are great for protecting documents from fire, much better than the cheap plastic clam-shell units sold at box stores. 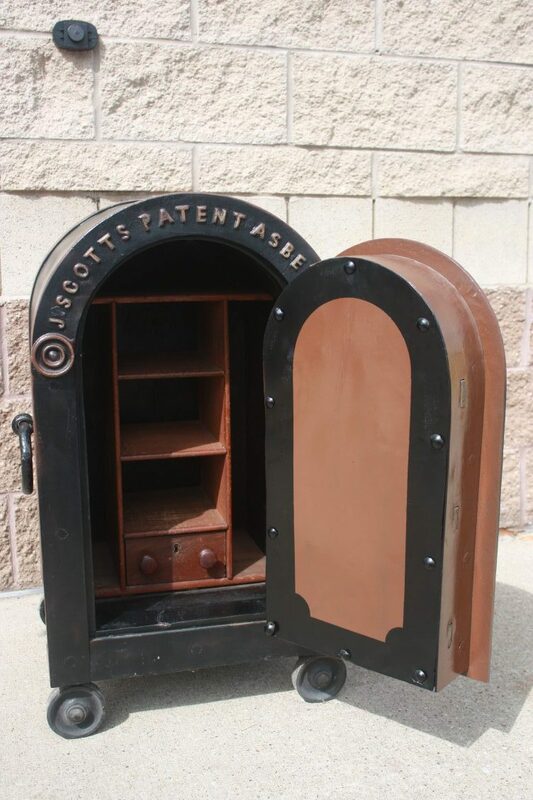 Don’t store valuables in these fire boxes, however: They are easy to drill open, and easy to pry open. A thief could also run away with one because they are relatively light and they have those handles. The dimensions of these little safes allow them to fit inside gun safes or other large safes to provide double fire protection. We frequently have them in stock and sell them for about $100. At yard sales, estate sales or on-line they go for a little less. Safe-T-Vaults and similar small safes are good low-cost fire protection. 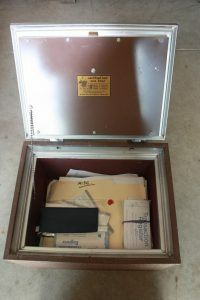 The last post talked about using an Auto Dialer, one method of opening locked safes or gun safes without drilling any holes. More often drilling is required. There are right ways and wrong ways to drill safes, however, so it is important to hire the right people for this work. Very often, especially in case of lock failure or lost combo, safes can be drilled in a way that leaves no visible hole. 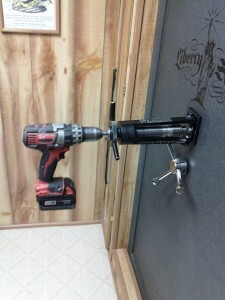 The photo shows a great way to do this on what happens to be a Liberty gun safe. The safe tech removes the dial or keypad, along with the dial ring/mounting plate. The well-equipped technician will have a drill rig similar to the one shown. It mounts to the front of the safe, screwing into the same holes used for mounting the lock. The drill rig holds the drill solidly in place and helps control it so that drilling can be done with extreme precision. The tech’s experience and knowledge tell him what is wrong with the lock and how the lock is situated inside the safe. Accurate measuring, or use of special drilling templates, allows him to drill a hole to hit one of a number of specific parts of the lock. Often that means drilling right into the lock body which is tightly packed with lots of parts. This also needs to be done without damaging anything inside the lock. Before getting to the lock body it is necessary to drill though the safe’s outside steel; it might be thin or it might be up to 1 ¾” thick. If it is a composite type safe there is insulation to go through. There is also normally some kind of hard-plate steel to go through. Special drill bits are required to penetrate most hard-plate. If done right, one small hole is usually required to unlock the safe. Repairs then need to be made, which involve filling the hole with a hardened tapered pins. That restores the safe to its original level of security. The lock may or may not need to be replaced. When the repairs are finished and the dial is re-installed the safe is as good as before, and no one can tell it was drilled. Last month we were called to open a locked vault. Someone else had already been there and put four holes into the front of it, without getting it open. The proper technique would have had the unit open with no visible hole. So remember, if the lock on your safe or gun safe ever fails, make sure to call skilled safe professionals first. In West Michigan or Central Michigan that would definitely be Hoogerhyde Safe.